Vikings quarterback Matt Cassel (16) looks on following a recent game against the Philadelphia Eagles at Mall of America Field. Another embarrassing loss and with one more game remaining, the focus for our mailers has definitely shifted to the future and what’s next for the Minnesota Vikings. Q: It’s been painfully obvious this year that this team needs to draft a Qb in the first round and Manziel seems like the perfect fit here,what i don’t understand is why so many fans out there seem to think that would be the worst thing we could do,i haven’t seen a college Qb with this much talent and upside in awhile,i get the maturity issues but he’s a young guy who will grow up and seems to have done alot of that this season.What do you think? — Winston Eaton, Sacramento, ca. Answer: Quarterback will be addressed in the offseason, surely. There’s no reason to believe Minnesota will return the same trio of quarterbacks next season. 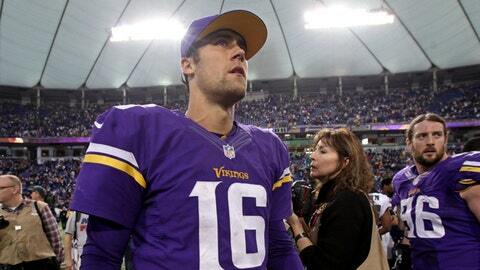 At least one of Christian Ponder, Matt Cassel and Josh Freeman won’t be back. At this point, I feel it’s an extreme longshot Freeman returns next season. The Vikings seem to have discovered what they wanted to with Freeman. Cassel has the option to return for $3.7 million on his contract next season, and could be back as a bridge to a young quarterback. While Ponder is likely no longer the team’s future at the position, he could return in the final season of his deal as a backup. Cutler or Cousins will be some of the options discussed by the team as it tries to find long-term stability at the position. Cousins is no sure thing and Minnesota would have to trade for him from the Washington Redskins. Cutler is one of a few free agents who will be under consideration. Drafting a quarterback still seems the most logical solution to the Vikings addressing the position. I believe they will look to the early rounds, and most likely the first round, to draft a young quarterback. Minnesota will have to be careful not to reach for a quarterback in the first round, but they will need to find an long-term starter for the first time since Daunte Culpepper injured his knee. Hageman would look good in purple and help the Vikings’ defensive line woes, but if he’s a first-round draft pick, Minnesota would be better off ending up with help elsewhere. Manziel will be a hot topic in the months leading up to the draft, presuming he enters the draft. He will be scrutinized heavily. He’s full of talent, but NFL teams will have to see if he has the mental approach to be a successful NFL head coach. The Freeman situation has been perplexing to many people. Think for a moment there is no conspiracy theory to worry about. Freeman was an inaccurate quarterback who had a falling out with the Tampa Bay Buccaneers. He showed inaccuracy again in his one game with Minnesota and has looked inaccurate during practices. After the reported issues with Tampa Bay and coach Greg Schiano, the Vikings got the chance to work with Freeman every day for 12 weeks. After 12 weeks of daily interaction in meetings and on the practice field, Minnesota’s coaches have had the chance to evaluate Freeman. They’ve likely had the time to make a decision on whether Freeman is a viable candidate long-term. The fact the Vikings haven’t started Freeman again likely gives us all of our answers about how the team and coaches feel about the one-time believed franchise quarterback with the Buccaneers. A: At this point, I consider it a given coach Leslie Frazier will be fired after the season, likely on the Monday after. I’m still not sure it’s entirely the right thing — I still believe Frazier can be a quality head coach — but a three-win season and a four-win season out of three years would spell doom for anyone. Frazier has the steady temperament and leadership qualities of a head coach, and the players enjoy playing for Frazier, but the team has fallen short at too many times in the past three years. Sunday’s embarrassing loss at Cincinnati might have been the final straw. Minnesota had won two of its three previous games, but looked unprepared and uncompetitive most of Sunday to go winless on the road this season. The only hope Frazier might have — or had — would have been changes at the coordinator spots. Offensive coordinator Bill Musgrave and defensive coordinator Alan Williams will be gone in any purge. 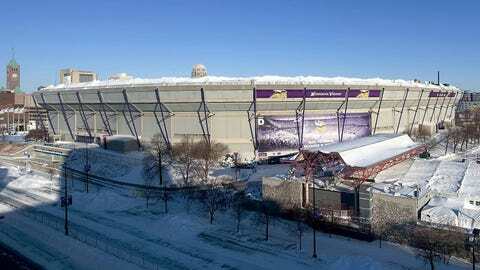 The Vikings might also need to dump the old Cover-2 system that Frazier and Williams prefer. And any change at coach and/or defensive coordinator likely will involve a dramatic shift in defensive philosophy. A: Stick with what works? The Vikings do rarely run sweeps or get Peterson on the true outside of a defense, but Peterson has had a lot of success in his career running off tackle. Peterson does have the speed to go outside, and maybe a new coaching staff will use him in that role. But Peterson also has the moves and power to make tacklers miss between the tackles. Getting Peterson outside, at least a bit more than Minnesota tries now, would be a strong idea. Peterson’s bread and butter is off tackle though. I’ve even wondered recently if Brian Robison might be a candidate to move to the right side, where he would be facing the league’s best tackles, but also approaching from most quarterbacks’ blind side. Of course, that would cause a hole on the left side and Robison has flourished there. I believe the Vikings will try to re-sign Griffen, but Griffen said earlier the two sides weren’t close to a deal. Griffen will surely try to shop around, but his best bet might be coming back to Minnesota, where he knows the team. If the two sides can’t come to an agreement, the Vikings will be searching for a new pass-rushing end that can play on all downs. There is no obvious replacement. Allen and Griffen are free agents at the end of the season, as is the only other defensive end on the roster in Justin Trattou. A look around free agency, or the draft, will be needed; not only for a starter, but depth as well. A: Gerhart’s lack of involvement was because he re-injured his hamstring on the third play of the game, going down to make a tackle on Bengals defensive end Carlos Dunlap after a Matt Cassel fumble. Gerhart missed the previous week with the hamstring injury and looks doubtful to play in the regular-season finale — likely his last game with Minnesota — after straining the hamstring again. A: In fairness, I don’t think Minnesota is "that far off" or "in a hole." The Vikings were competitive all year long and we’ve seen plenty of cases — the Vikings last year — in which a team can turn things around quickly in the NFL without major change. I understand what people are aiming for when they talk of trading Peterson for a load of draft picks, but those Herschel Walker type of trades just don’t happen anymore in the NFL. Not to mention, with the league so fixated on the passing game, many teams look at the running back position as a complementary piece, and wouldn’t give the price Minnesota would need to trade its franchise running back. I don’t think trading Peterson is the answer. He’s the best running back in the NFL and still one of the most dynamic playmakers with his breakaway ability. The Vikings’ offense, in particular, isn’t far off from being a top-flight offense, and just needs to find a steady quarterback to be one of the best in the league, led by Peterson. A: Whoa, heavy. I don’t know if I can capsulize that question properly, and I sure don’t have all the answers. I think being a successful coach can come about different ways, with different philosophies. It’s proven to be the case in the NFL over the years. The most important thing is having good players, of course. However, I think a successful football coach needs help. He needs a strong coaching staff, and coordinators that can exploit the "Xs and Os" of the game. A successful head coach should probably be a strong leader, respected by the players. He should command the attention of the players and be a motivator. There are key traits likely involved in all good coaches: Smart, detail-oriented, focused, organized, respected and be a motivator. But all types of coaches and systems have won in the NFL. A: Another philosophical question. I’ll keep this one simple. Minnesota’s New Year’s resolution should be to find an answer to their long-sought quarterback problems. The defense surely needs help — and is 17 points away from giving up the franchise record for points in a season. But the Vikings need to stop their rotation at the quarterback position that has really been unsettled for years. We’ve seen this year what a quality quarterback can mean for an organization and even cover up holes for the rest of the team, such as the situation in Green Bay once Aaron Rodgers was hurt. We saw how Matt Cassel changed the look of the Vikings’ offense when he was going well. Getting a franchise quarterback, a long-term answer, is the most important thing the organization can do this offseason. I’d put finding elite coordinators second on the list. A: Did you go to Vegas with those predictions? Curiously, 8-7-1 might just win the division. I don’t believe there needs to be a doom-and-gloom look to next year. So many things can happen and things can turn quickly. This will be a big offseason for Minnesota, maybe picking a coach, coordinators, quarterback, defensive system and players. I can’t really look at calling a record or amount of wins for next season. So much is dependent on what happens in the offseason, but I think turning the team around quickly and making the playoffs isn’t, and shouldn’t be, far-fetched.